Three weeks ago there was the Product Innovation conference in Düsseldorf. In my earlier post (here) I described what I experienced during this event. Now, after all the information is somehow digested, here a more high-level post, describing the visible change in business and how it relates to PLM. Trying to describe this change in non-academic wording but in images. Therefore, I described the upcoming change in the title: from linear to circular and fast. This linear approach is reflected in how organizations are structured, how they are aligned to the different steps of the product development and manufacturing process. Below a slide I used at the end of the nineties to describe the situation and the pain; lack of visibility what happens overall. It is discouraging to see that this situation still exists in many companies. 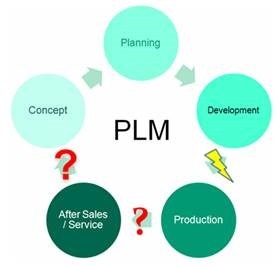 At the end of the nineties, early 2000, PLM was introduced, conceptually managing the whole lifecycle. In reality, it was mainly a more tight connection between design and manufacturing preparation, pushing data into ERP. The main purpose was managing the collaboration between different design disciplines and dispersed teams. Jim introduced the circle and the arrow. 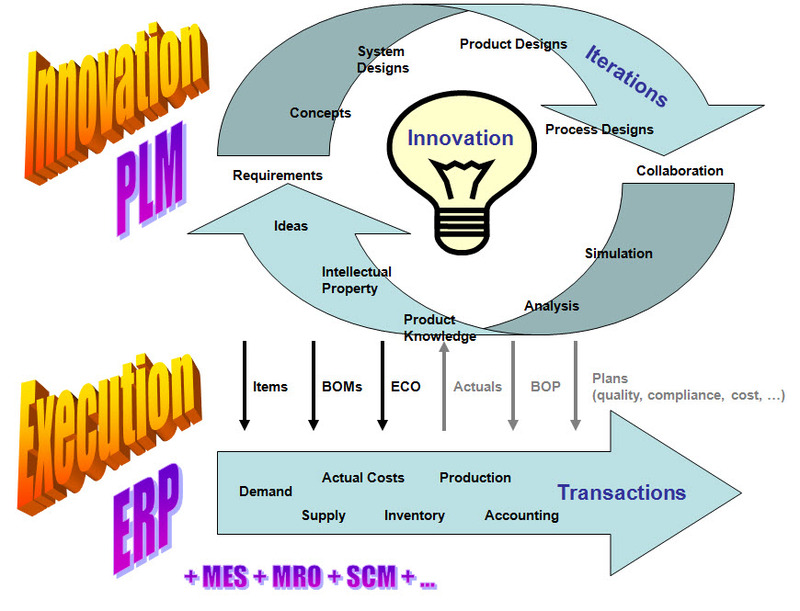 PLM: a circle with iterations, interacting with ERP: the arrow for execution. Here visual it became already clear an arrow does not have the same behavior as a circle. The 100 % linearity in business was gone. 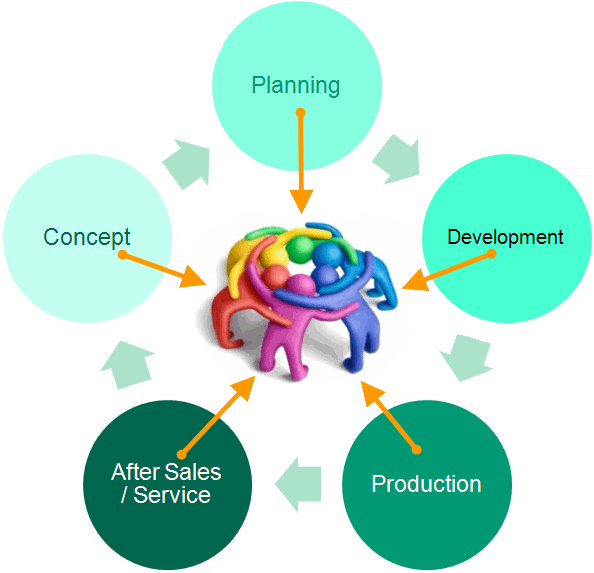 Due to the implementation of siloed systems for PDM, ERP, SCM and more, the flow of information is disconnected when moving from the design domain to the execution domain. Information is pushed in the ERP system as disconnected information, no longer managed and connected to its design intent. Next, the ERP system is most of the time not well-equipped for managing after sales and services content. Another disconnect comes up. Yes, spare parts could be ordered through ERP, but issues appearing at the customer base are not stored in ERP, often stored in a separate system again (if stored beyond email). The result is that when working in the concept phase, there is no information available for R&D to have a good understanding of how the market or customers work with their product. So how good will it be? Check in your company how well your R&D is connected with the field? This could have stayed reality for a long time if there were not a huge business change upcoming. The world becomes digital and connected. As a result, local inefficiencies or regional underperformance will be replaced by better-performing companies. The Darwin principle. And most likely the better performing companies are coming from the emerging markets as there they do not suffer from the historical processes and “knowledge of the past”. They can step into the digital world much faster. In parallel with these fast growing emerging markets, we discovered that we have to reconsider the ways we use our natural resources to guarantee a future for next generations. Instead of spilling resources to deliver our products, there is a need to reuse materials and resources, introducing a new circle: the circular economy. 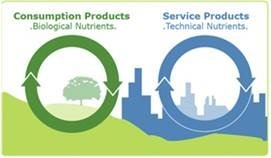 The circular economy can have an impact on how companies bring products to the market. Instead of buying products (CAPEX) more and more organizations (and modern people) start using products or services in a rental model (OPEX). No capital investment anymore, pay as you go for usage or capacity. This, however, has an impact how traditional companies are organized – you need to be connected to your customers or you are out of business – a commodity. The digital and connected world can have a huge impact on the products or services available in the near future. You are probably familiar with the buzz around “The Internet of Things” or “Smart and Connected”. No longer are products depending on mechanical behavior only, more and more products are relying on electrical components with adaptive behavior through software. Devices that connect with their environment report back information to the manufacturer. This allows companies to understand what happens with their products in the field and how to react on that. Remember the first PLM circle? Now we can create continuity of data ! Combine the circular economy, the digital and connected world and you will discover everything can go much faster. A crucial inhibitor is how companies can reorganize themselves around this faster changing, circular approach. Companies need to understand and react to market trends in the fastest and adequate way. The future will be probably about lower volumes of the same products, higher variability towards the market and most likely more and more combining products with services (the Experience Model). This requires a flexible organization and most likely a new business model which will differ from the sequential, hierarchical organizations that we know at this moment. The future business model ? The flexibility in products and services will more and more come from embedded software or supported by software services. Software services will be more and more cloud based, to avoid IT-complexity and give scalability. Software development and integration with products and services are already a challenge for classical mechanical companies. They are struggling to transform their mechanical-oriented design process towards support for software. In the long-term, the software design process could become the primary process, which would mean a change from (sequential – streamlined) lean towards (iterative – SCRUM) agile. Once again, we see the linear process becoming challenged by the circular iterations. This might be the end of lean organizations, potentially having to mix with agile conepts.. If it was a coincidence or not, I cannot judge, however during the PI Conference I learned about W.L. Gore & Associates, with their unique business model supporting this more dynamic future. No need to have a massive organization re-org to align the business, as the business is all the time aligning itself through its employees. Last weekend, I discovered Semco Partners in the newspaper and I am sure there are more companies organizing themselves to become reactive instead of linear – for sure in high-tech world. Linearity is disappearing in business, it is all about reactive, multidisciplinary teams within organizations in order to support customers and their fast changing demands. What do you think ? The end of linear ? Agree and a good conclusion. This will also require IT system support that is less process centric and more based on triggers and events as a change or notification can come from anywhere and anyone. And more focus on a federated PLM system with good information consolidation to understand the full picture, do analytics and make optimized trade off decisions.